Sean Payton: Saints were ‘one of those teams in line’ for Beckham Jr.
Sean Payton didn't shy away from the fact that he had major interest in Odell Beckham Jr. in last year's draft. Sean Payton has no reason to shy away from the simple fact that the New Orleans Saints were targeting Odell Beckham Jr. in last year’s NFL draft. To be honest, he admitted that he was in line for Beckham, just like everyone else was, according to Mike Triplett of ESPN. As we know, the Saints were obviously in the market during that draft, as they traded up from No. 27 to No. 20 to land Brandin Cooks. Payton didn’t stop at just praising Beckham either, as he spoke about LSU’s pro day and watching a highlight video of Beckham and current Miami Dolphins receiver Jarvis Landry. “We were up for the workout, I went in a room and it was Odell and (fellow LSU receiver Jarvis) Landry,” Payton said. “We’ve got this highlight tape that was put together, it wasn’t game tape, it was practice tape, and we sat in there for about 15 minutes. And I just remember coming away from the meeting like, ‘Holy cow!’ And I would say it was one of the most impressive pro days in regards to receiver workouts. You have those two running around, just a lot of skill on the field. 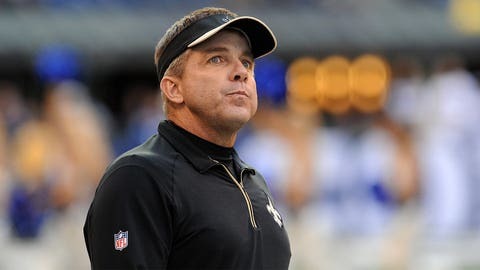 Well, after the rave reviews, Payton and the Saints will face off with Beckham and the Giants in the Superdome in Week 8, for what should be must-watch TV.